The folks at Harvest Snaps were kind enough to send me a big box of products to sample from their healthy snack line, which includes four flavors of Snapea Crips and two flavors of Lentil Snaps. The snacks are made from 70% whole peas (65% lentils on the two lentil flavors.) With less fat and fewer calories than chips, the crisps also are higher in fiber and lower in sodium. A comparison chart on the package indicates what a huge difference you'll find in the crisps as compared to potato chips. 6 g of fat vs. 10 g in potato chips. The crisps have 80 mg of sodium, while potato chips have 170 mg in a one-ounce serving. So, if they are this healthy, could they actually be good? They can. I opened one of the six bags to take a taste - it was the salted flavor pictured below. Not bad. The crisps are far from bland and because they are airy with a consistency similar to a puffy cheese curl, it's something that kids may even easily embrace. We'll try out the other flavors in the coming days and I'll fill you on on the rest. 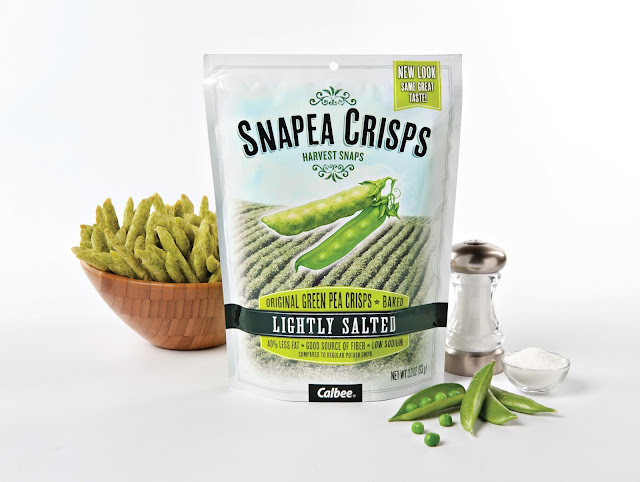 Harvest Snaps products can be found at select Walmart Supercenters, Dominick's, 7-11, Costco, Lowe's and Whole Food Markets. Visit www.harvestsnaps.com and enter your zip code to find the closest stores to you that carry Harvest Snaps. Also, find them on Facbook and Twitter.